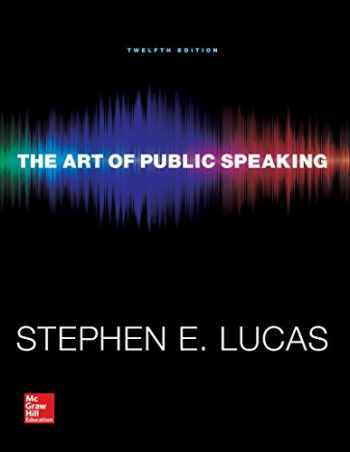 Acknowledged author Stephen Lucas wrote The Art of Public Speaking with Connect Access Card comprising 368 pages back in 2014. Textbook and etextbook are published under ISBN 1259545997 and 9781259545993. Since then The Art of Public Speaking with Connect Access Card textbook received total rating of 3.5 stars and was available to sell back to BooksRun online for the top buyback price of $70.48 or rent at the marketplace. For over 30 years, instructors around the world have successfully used The Art of Public Speaking to teach the development and presentation of effective speeches. Through personalized and adaptive instruction, the program helps each student think critically, build confidence, and make the leap from learning the principles to mastering competent speaking in the classroom and throughout life.Connect is the only integrated learning system that empowers students by continuously adapting to deliver precisely what they need, when they need it, and how they need it, so that your class time is more engaging and effective.